It seems that not a month goes by without a new Samsung tablet surfacing. It's made the market so busy with options that, frankly, it's got downright confusing. So let's cut to the skinny: the Tab S, seen here in its 8.4-inch version, is one of the best tablest the company has yet made. The S is not only more affordable than it's better-sounding TabPro equivalent, it's also faster and slimmer but comes with an AMOLED screen rather than LCD. It also lacks the built-in stylus (or S Pen as Samsung likes to call it) of the Note and NotePro ranges. That's roughly the long and the short of it, Samsung succeeding in stuffing the word "Tab" into your inner psyche whether you like it or not. But all that hard work of hammering out various Tab models has been a public learning curve - and one that's been profitable for the evolution of the product. The company has responded to criticisms, slimmed down the design, crafted the on-board software into a more efficient operation and is flying the flag for the best Android tablets out there. 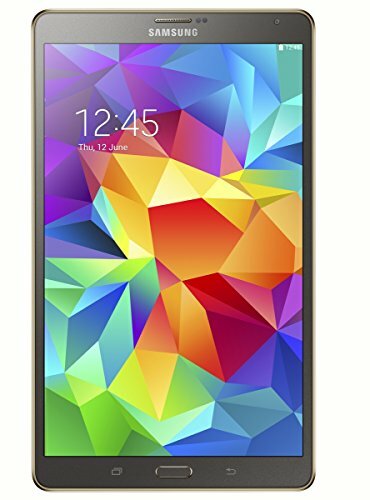 If you don't want a stylus for operation then is the Samsung Galaxy Tab S 8.4 the best Android tablet on the market? The defining characteristic of the Tab S is its gold-edge finish, which we think works really well in either black or white options. The gold edging has more than a hint of white iPhone 5S about it though. Current trends and all that. What really makes the Tab S stand out is its thickness - or "thinness" to be more accurate. Measuring 6.6mm it's a full millimetre thinner than the iPhone 5S we just mentioned. Indeed it's thinner than most top-end smartphones that you'd happen to handle, and leaves most of the tablet competition in the dust. It's only obvious shortcoming is Samsung's persistence to use a budget-looking plastic back. Gone is the faux leather finish of the TabPro model, but the dimpled rear - now complete with two circular recessed "buttons" to attach an optional case - consistently fails to meet the same quality as something like the iPad Air. Elsewhere, though, the finish is of a high quality. The metallic edging and buttons feel decent and encase the front glass panel with a only a fingernail-width protrusion. In portrait orientation there are two soft keys sat off the main display, surrounding the one centre physical home key - a design that Samsung continues to opt for, but with practical purpose thanks to the built-in fingerprint scanner. However, and as we mentioned in the larger Tab S 10.5 review, the bezel has shrunk to such a considerable degree that it's not the easiest tablet to use in portrait orientation. There are mere millimetres of bezel to the long edges, which isn't enough to stop fingers protruding onto the actual display. Not that we want Sony Xperia Tablet Z2 levels of mega-bezel, but a happy medium would be good. Saying that, flip into portrait mode and the Tab S is a great experience: perfect for watching movies on the go. An apparent upgrade for the Tab S is the AMOLED screen technology used, hence the slim design. Only it's not really an upgrade because it uses a PenTile array that is likely to be less sharp compared to the TabPro's LCD display. As we mentioned in the 10.5-inch model review, the sharpness when firing up Real Racing 3 wasn't as impressive as the older Nexus 10, which shares the same resolution. But all the talk of it being a less sharp display in its 8.4-inch variety has little real-world meaning at the moment. The Tab S delivers a 2560 x 1600 pixel resolution, which is knocking on the door of 360 pixels per inch, which is well beyond the competition. It doesn't disappoint in performance terms either. It's a huge number of pixels on such a surface area, surpassing an HD TV by roughly two to one, meaning there's stacks of detail in everything that we've looked at or played - it sees the near competitors, such as the LG G Pad, take a back seat. But the use of AMOLED does have its drawbacks. Colour is heavily saturated - often to excess - and just as we found with the 10.5-inch model there's a warm colour cast too. However, there are different display modes (as well as an adaptive mode) to help you find a happier display medium. Once you've got things set-up as you like them, there's little else to fuss about in terms of display. We did find the screen coating to be a little reflective, but decent levels of brightness can counter this problem in most light, while the wide viewing angles mean you can take a glance at the screen from unnecessarily obtuse angles without contrast falling away. Samsung isn't mucking around when it comes to power. Under the hood the Tab S 8.4 packs in an Exynos octa-core processor, comprised of four 1.9GHz cores and four 1.3GHz cores - the idea is to give you more options for balancing power requirements - paired with 3GB of RAM. It might not have "Pro" in its name, but that's 50 per cent more RAM than the TabPro 8.4. The result is that the Samsung Galaxy Tab S is slick and fast. Basic navigation is very smooth, apps load fast, having lots of things open at once is of little consequence, and Samsung's own software optimisation and makes good use of both power and screen space. Having that physical home button also doesn't eat into desirable screen space, which makes a lot more sense than having a trio of soft keys popping up over whatever you're looking at. It also houses the same fingerprint scanner as found in the Galaxy S5 smartphone which, despite working in same way as the phone, functions much better with two-handed tablet use than it ever did with the phone. Internally there's 16GB of storage, of which about 4.5GB is used by the system software. There are no options for greater storage capacity, but the inclusion microSD card slot means you can buy into a card up to 128GB to massively increase storage at minimal cost. However, what with this being Android 4.4 KitKat, heavyweight apps need to be stored on the system space, not the off-board microSD card space, so if you have a few huge gaming apps such as Batman then you'll quickly run out of the desirable core space. We think a 32GB model would have probably made sense. The main decision to make when buying is whether to opt for the £319 Wi-Fi only model, as reviewed here, or the £399 Wi-Fi and 4G model for £399. It's not often tablets come to the UK with mobile connectivity, but the option is there if you want it. The extra cash isn't merely for the SIM slot, though, as there's a whole 4G antenna in the body - not that we've been able to test it given the configuration of our Wi-Fi-only model. In terms of sound output there are twin speakers mounted on the top and bottom (in portrait orientation) that are poorly placed for use in landscape orientation. A two-handed grip while playing a game will see the fatty parts of your hands cover them slightly and project sound backwards. Or perhaps we just have particularly fat hands. It doesn't mute the sound, mind, it just doesn't sound as top drawer as it could. It's taken a while for Samsung to settle down and relinquish much of its pre-installed bloatware. But the Tab S arrives in a good place from a software perspective. When we reviewed the Samsung Galaxy TabPro we were generally impressed with the software and it's a similar experience here with some small but useful updates. There's the TouchWiz interface overlaying Android 4.4 KitKat, with access to the Magazine UX - a Flipboard-based news and current events homepage - just a single left swipe away. It's customisable, so you can tell it to show you lots of calendar information, emails, news and more. However, the presence of UX means software can be accessed in the usual Android icon-based way, or via the UX portal. This two-point access isn't confusing, as such, but can overcomplicate things: you'll be glancing at your emails in a UX window but alerts via the the usual Google Notifications pull-down menu will still be active, so if an email arrives you'll potentially get to know about it via two sources. New points of note are a My Files shortcut in the bottom left corner of the homepage which takes you through to your files and folders. It includes timeline access - also available via the menu soft key - to make it easier to get back to files you might have been recently accessing. When the screen locks there are also tile notifications at a glance, including new email titles, upcoming calendar events, and current weather. Included with the Tab S is a two year 50GB of Dropbox cloud storage account, but now there are Galaxy Gifts to tempt you further. A glance through the list sees these range from three months trial subscription to Marvel Unlimited, a free Play Movies blockbuster movie download, in-game prime car pack for Asphalt 8 and all manner of other goodies. They may tempt you in, they may not, but are certainly on the nice-to-haves list. We don't really mix with tablets and taking photos. But the Tab S 8.4 is well equipped to take snaps if you want to thanks to its 8-megapixel rear camera. There's a front-facing 2.1-megapixel option for video conference calls and the like too. The results from the camera are just like that from the bigger brother 10.5-inch model: we've found them to be pretty good in tablet terms. Low-light shots aren't quite so great, but there's also a flash included which may come in handy to inject some light. Then there's battery life. The 4900mAh battery capacity is considerably less than the 7900mAh offering in the 10.5-inch model, but less screen real estate keeps battery life approximately relative between the two. We were surprised by how long the Tab S 8.4 lasted given the numbers: we've been using it for a full day at a time without fully depleting the battery. Roughly speaking that's around nine hour's use for standard use. There's a lot of good to say about the Samsung Galaxy Tab S 8.4. So much that it irks us just how many other Tab devices are available through the range, because it muddies the water. In some respects the Tab S should make things crystal clear: if you don't want a stylus then it's the best of the bunch in our view. Saying that, it's not drastically different from the TabPro in many respects, so ponder whether you want LCD screen subtleties and sharpness or AMOLED colour punch. It's taken time, but the Tab S feels like an accumulation of software and hardware arriving where they should be. For the most part anyway: that 6.6mm slim build is impressive, but we're still left disappointed by the typical Samsung plastic rear, while the amount of bezel in portrait orientation has shrunk to excess. There are lots of Android tablets available and even if Samsung can't help but bombard us with a billion similar (yet different) namesakes, it's still a company that knows how to make them - and make them well. If you're after an Android tablet then the Tab S really is as good as they come. It's slim yet powerful, has a great screen and a software experience that's at the top of the stack. In short the S sets the mark for Android tablets at this price point and size. All there is to do now is simplify the naming convention and deliver a slightly more premium build - then it'll be job done Samsung.